Seeking the modernization of Agriculture, Food and AquaME Conferences with great pleasure welcomes all the contributors in the food and health industry across the globe to the 2nd International Conference on Agriculture, Food and Aqua on November 18-19, 2019 in Bali, Indonesia with a theme of “Seeking the Modernization of Agriculture, Food and Aqua”. The conference highlights keynote presentations, oral talks, poster presentations, and exhibitions. All the speakers, participants, students, and delegates from across the globe are cordially invited to the event. The international AFA 2019 conference encourages the young student researchers through Poster Award Competition and Young Research Forum at the conference venue. 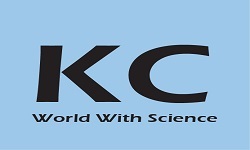 ME Conferences organizes 3000+ global events inclusive of 1000+ conferences, 600+ workshops and 400+ symposiums on various topics of science and technology across the globe with support from 1000 more scientific societies and publishes 700+ open access journals. The scientific events are specially designed cluster of the program that provides a common platform to exchange and share the experiences and research results on all aspects of agriculture, food, and aqua science. Our aim is to aggregate community and to create a platform for the exchange of information on technological developments, new scientific innovations and the effectiveness of various regulatory programs towards AFA 2019. It provides a premier technical forum for expressing and knowledge about the advanced research and developments, as well as the exploration of new applications, technologies and to explore new trends in the field of Agriculture, Food and Aquaculture. Farmers have modified plants to create the desired traits by the use of various scientific tools and techniques, the method to be known as, agricultural biotechnology. Agricultural biotechnology is being employed to handle issues altogether areas of agricultural production and process. This includes plant breeding to boost and stabilize yields, to boost resistance to pests, diseases and abiotic stresses like drought and cold, and to boost the nutritionary content of foods. It is being used to develop low-cost disease-free plants and also to increase the breeding capacity of plants. Agricultural biotechnology is criticized to create long-term adverse effects like developing new allergens, weeds that are resistant to herbicides, farmers may use additional chemicals to treat crops genetically built to resist poisons and biotechnology may also advance a decline in biodiversity but it should be thought of as a supplement to existing crop improvement programmes. Sustainability is based on the principle that the needs of the present should be met without compromising them for future generations. The goal of sustainable agriculture is to fulfill society’s wants within the gift while not compromising it for the future generations to fulfill their own wants. This type of agriculture tries to seek out an honest balance between the necessity for food production and also the preservation of the ecological system. There are other goals related to sustainable agriculture, like conserving water, reducing the employment of fertilizers and pesticides, and promoting biodiversity in crops ecosystem. In agricultural production systems, it is necessary to acknowledge the characteristics of varied resources employed in production, the way they're managed or manipulated within the production method and also the technologies and practices which render the production system unsustainable. There is a need to ensure that the activities do not render the farming systems unsustainable. Agricultural ecology should be maintained as well as promoted. Horticulture is a form of agriculture which includes special method and techniques to improve plant products like vegetables, flowers, medicinal plants, nuts, seeds, sprouts, mushrooms, algae, grass, and decorative trees and plants. Through horticulture, we can do plant conservation, landscape restoration, soil management, and garden design, construction and maintenance and arboriculture. Horticulturists are working in the plant development, plant quality, and nutrition, and protect plants from insects, pests, disease, and environmental anxieties. Soil acts as a base medium provide habitat, water, and nutrition to living organisms. Soil purifies groundwater, provides nutrients, help in the growth of plants and regulate the Earth's temperature. In recent decades, scientists have developed new practices which limit the mobility of contaminants which reduce pollution. Livestock Farming is an agricultural practice to produce commodities such as food, fiber, leather, wool, and labor by raising domestic animals like poultry, cow, cattle, fish and other mammals. In recent years, livestock farming is very well managed as animals are provided with proper nutritional food and shelter. However, indoor animal farming has often been criticized for multiple reasons - on grounds of pollution and for animal welfare reasons. Livestock farming plays a major role in the agricultural business and economy of major developing countries. Veterinary science deals with the health and wellbeing of animals. Like medical degrees, this encompasses everything from preventative care to psychological analysis and complex surgical procedures. Entomology is the study of insects and their relationship to humans, the environment, and other organisms. The study of insects serves as the basis for developments in biological and chemical pest control, food and fiber production and storage, pharmaceuticals epidemiology, biological diversity, and a variety of other fields of science. Animal foods are a discipline that requires a complete understanding of the complexities of antemortem and post-mortem factors that impact the final product for the consumer. They are a source of high biological value protein, fat, vitamin A, vitamin B12, riboflavin, calcium, iron, and zinc. In addition, animal foods are in general more distinctive in flavor and texture and often more palatable than foods of vegetable origin. Animal source foods include many food items that come from an animal source such as meat, milk, eggs, cheese, and yogurt. The processing of animal foods requires proper slaughtering methods, hygiene maintenance, and appropriate processing techniques. Apart from the food products, many by-products are also made from animal sources like chitin, chitosan, lecithin, and products from animal wastes. These processing technologies are a consequence of customer demand for natural, high quality and healthy product that are safe. It aims at examining recent applications in the pulsed electric field, high-pressure technologies, food microbiology, and modern thermal and non-thermal operations to prevent the occurrence of food-borne pathogens, extend the shelf-life of foods, and improve the safety, quality, and nutritional value of varied food products. High-Pressure Processing (HPP) is a non-thermal pasteurization technique whereby products are held at high pressures for a few minutes. The preference of this method over the standard thermal processing techniques involve less process time, less heat damage and retention of product flavor, texture, color, and nutrients of a number of liquid and semi-liquid foods. In the pulsed electric field (PEF) food is exposed to a pulsed high voltage which inactivates the bacteria. Hurdle technology involves combining more than one approach of preservation on food. All these approaches enhance food safety and quality without compromising the nutritional quality and safety. Food microbiology is the study of the microorganisms that contaminate food and also those used in the production of food. The micro-organisms either use the nutrients of food or synthesize new compounds that cause spoiling of food. Food safety is a major target of food microbiology. Various pathogens are transmitted through food like bacteria, virus and other toxins. Although various contaminants are removed during cooking still some of them may remain in the food. To ensure the safety of food products, they are tested through chemical and biological methods and measures are adopted to minimize them. The application of molecular analyses has allowed scientists to handle micro-organisms beyond merely determining whether particular pathogens are in a food. Apart from spoilage, some micro-organisms are used to prepare fermented food using plant and animal sources. Sometimes some live bacteria improve the health by promoting the body’s natural immunity and boosting the digestion system. Some foods are specially altered so that they can fulfill the special health needs of the consumer. These may be in terms of taste, health or preservation. In this line, genetically modified foods are those produced from organisms whose DNA is changed using the by genetic engineering. The main advantage of genetically modified foods is that it does not require any change in the dietary pattern of the people and can provide the suggested amount of nutrients regularly. It can be easily blended with the existing system of food production and distribution. In developed countries, these foods play a major role in improving the diet and eradicating nutritional deficiencies. Food additives are those that are added to the food to maintain as well as improve the taste, texture, shelf-life, safety, and freshness of the foods. Food additives can be either naturally derived from plants and animal sources or synthetic. It may include sequestering agents, acidity regulators, chelating agents, emulsifiers, stabilizers, sweeteners, colorants, and preservatives. Preservatives are used to prevent or delay bacterial and fungal growth in foods. These additives delay spoilage of food or extend the shelf life of the finished product. The amount of the additives to be used in food is regulated and specified by the government because the increased amount of some of the additives could be harmful to the body. E-numbers are given to all the additives to administer them and to educate the customers. Government authorities monitor and ensure that food additives in food and drinks produced in their countries adhere to the permitted uses, conditions, and legislation. Aquaculture is a commercial farming technique of breeding fish, algae, aquatic plants, and other organisms in freshwater and saltwater systems under controlled conditions. The main aim of aquaculture is the production of protein-rich, palatable, nutritive and easily digestible human food at a reasonable cost, providing strengthening stocks and new species of existing fish in natural and man-made water-bodies. Fisheries science is the art of managing and understanding fishes. It includes freshwater biology, limnology, marine biology, conservation, ecology, oceanography, economics, and management. Fisheries science helps to formulate and maintain the quality of fish and fishery products. Waste management includes the activities required to manage waste from its initiation to its final disposal. This comprises a collection, transport, treatment, and disposal of waste. The waste can be treated either by physical, chemical or biological methods. Water Management is important since it helps determine future Irrigation expectations. Water management is the management of water resources under set policies and regulations. Good water management of dams and levees reduces the risk of harm due to flooding. Irrigation water management systems make the most efficient use of limited water supplies for agriculture. Food analysis is that discipline which addresses the application and study of analytical procedures for characterizing the properties of foods and their constituents. These analytical procedures give information about the composition, structure, chemistry, properties and sensory attributes of foods. This data is important to our rational understanding of the factors that verify the properties of foods, and also our ability to economically make foods that are systematically safe, nutritional and fascinating and for customers to buy products as per their diet. Food safety can be confirmed by proper quality control in terms of appearance, texture, flavor and shelf life. The importance of distinct food ingredients and operations which determine the ultimate properties of foods should be realized so that the production method could be managed to provide the final product with consistent properties. Agriculture plays a crucial role in the economy of a country and agricultural economics is concerned with the application of economic theory in optimizing the production, allocation, and distribution of food. It is also sometimes referred to as agronomics. Agricultural economist should allocate the resources in the agricultural industry with the substitute in production; marketing or public policy. Agribusiness is the business of agricultural production. It includes agrichemicals, breeding, crop circulation, farm machinery, processing, and seed accumulation, as well as marketing and retail sales. All agents of the food and fiber value chain and those institutions that influence it are part of the agribusiness system. Dietary transitions in human records were suggested to play essential roles within the evolution of the human race. The main purpose of public health intervention is to boost health and prevent diseases but the problems of changing food habits result in both positive and negative impacts on human health. The diet of an individual is determined by the process, the supply, and taste property of foods. A healthy diet includes storage ways and preparation of food that may preserve nutrients from oxidation, heat or natural process. Research in nutrition terms may make it easier for us to make better food choices and keeps us healthy. Contemporary dietary patterns have led to acceptable results like increased nutritional efficiency, decreased the risk of allergies and also diseases like prevention of hypertension, cardiovascular diseases, and chronic diseases. It may give negative results such as causing skin irritation, difficulty in breathing, headaches, cancer due to pesticides; obesity, food poisoning, diabetes, dental problems, high blood pressure and depression due to processed foods; and arthritis, meningitis, inflammation of joints and ciguatera from fisheries. Agriculture can facilitate economic conditions, hike earnings and improve food security for 80% of the world's poor, who work mainly in farming. With modern agricultural techniques, the market is increasing using improved seeds, chemicals, and fertilizers. Also, the employment of sensors and increasing adoption of livestock face recognition is facilitating the market growth. Increasing support from the government for the development of new farming techniques and global awareness regarding the benefits of agriculture over the years are expected to boost the growth of the agriculture market during the future period. The modern world has substituted home-cooked food with processed food, resulting in the growth of the processed food industry. The global food processing equipment market is driven by the increasing consumer demand for processed food, focus on food safety and safety of workers, growing need to increase productivity, increasing the focus of food manufacturers to cut down manufacturing cost, and government support to push food processing sector. 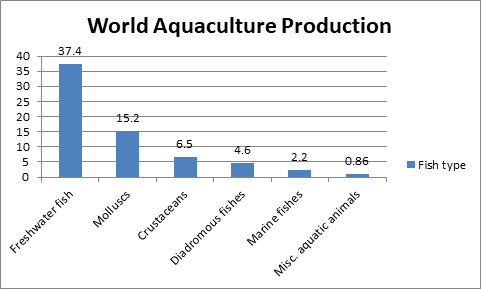 Aquaculture is also becoming the rapid food-producing sector in the world. With the increase in population, the demand for aquatic food products is also increasing. Production from capture fisheries has increased and most of the main fishing areas have reached their maximum potential. Sustaining fish supplies from capturing fisheries will not be able to meet the growing global demand for aquatic food. Agriculture, food, and aquaculture are a significant source of national income for developing countries. The global food technology market expands drastically by 2022 the expected growth of food technology market is over $250.43 billion. The global market of probiotic ingredients and supplements has reached $23.1 billion in 2012, $27.1 billion in 2013 and it may reach $36.7 billion in 2018. The processed food industries are also valued at over $2 trillion dollars globally and consist of over 400,000 businesses. Aquaculture market was valued at USD 156.27 billion in 2015 and is anticipated to achieve USD 209.42 billion in 2021. This growth is attributed to a number of factors such as suitable weather conditions, availability of natural resources and labor at a cheap salary. Furthermore, North America and Europe are expected to have significant growth in the near future owing to advancing trends in aquaculture. Bali is a province of Indonesia and an island on the westernmost of the Lesser Sunda Islands. Located on the east of Java and west of Lombok, the province includes the island of Bali and a few smaller neighboring islands. Bali is Indonesia's main tourist destination. It is renowned for its highly developed arts, including traditional and modern dance, sculpture, painting, leather, metalworking, and music. 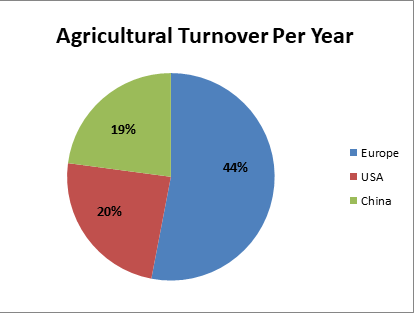 Agriculture is the island's biggest employer. Fishing also provides a significant number of jobs. Balinese farmers pride themselves with their time-tested methods of sustainable farming. The European Society of Agricultural Engineers (EurAgEng), The European Association of Agricultural Economists (EAAE),European Society for Agricultural and Food Ethics (EurSafe), European Association for Agroecology, The European Federation of Food Science and Technology (EFFoST), European Food Safety Authority (EFSA), The Federation of European Nutrition Societies (FENS), The International Wine and Food Society (IW&FS), European Aquaculture Society, Australian Institute of Food Science and Technology, International Association of Food Industry Suppliers, USA, International Bottled Water Association, USA. National FFA Organization, American Farm Bureau Federation, San Francisco Professional Food Society (SFPFS),The Confrérie de la Chaîne des Rôtisseurs: Food and Wine Society, World Apple and Pear Association, The United States Aquaculture Society (USAS), National Aquaculture Association, Colorado Aquaculture Association, American Society for Parenteral and Enteral Nutrition, USA. Middle-Eastern agricultural civilization, Malaysian Society of Soil Science, Middle Eastern Food and Culture Society, The Middle East Aquaculture Forum, National Agricultural Cooperative Marketing Federation of India Limited (NAFED), Fishing Technology Association, Society of Fisheries Technologists, Aquaculture Fish Farming Associations. The International Conference on Agriculture, Food and Aqua hosted by ME Conferences was held during November 22-23, 2018 at Cape Town, South Africa on the theme “Discovering Natural Resources through Agri-Food-Aqua 2018”. Bennie van Zyl, Transvaal Agricultural Union, South Africa. Agri-Food-Aqua 2018 Organizing Committee extends its gratitude and congratulates the Honourable Moderator of the conference, Nolitha L Skenjana, Dohne Agricultural Development Institute, South Africa for her preeminent contribution towards smooth functioning of this esteemed event. We acknowledge the help of the Honourable Chair Mohd Kushairi Mohd Rajuddin, Universiti Selangor-Bestari Jaya Campus, Malaysia for session Agriculture Biotechnology | Sustainable Agriculture | Agriculture Economics | Food Analysis, Safety and Health | Food Biochemistry and Chair Wongiwe Theodora Mngwambe, Potchefstroom College of Agriculture, South Africa and for session Sustainable Agriculture | Agriculture Biotechnology | Food Microbiology | Technology of Animal Foods | Aquaculture Science | Fisheries Science. Their support brought this event to its grand success. Agri-Food-Aqua 2018 has taken the privilege of felicitating Keynote Speakers Bennie van Zyl, Transvaal Agricultural Union, SouthAfrica, ,and Elton Mitchel Greeve, EMG Agri Solutions, South Africa whose attempts made the social occasion to move in the method for achievement. We were indebted by their presence. We sincerely thank the Organizing Committee Member Wongiwe Mngwambe, Potchefstroom College of Agriculture, South Africa, for her gracious presence, support, and assistance towards the success of the conference. · Wendy Katiyo, University of Pretoria, South Africa. · Nuhu Bello Rano, Bayero University, Nigeria. · Mickhale Green, Yale University School of Forestry & Environmental Studies, USA. We hope your favorable support will make next series 2nd International Conference on Agriculture, Food and Aqua to be held during November 18-19, 2019 in Bali, Indonesia too a grand success event.